Architecture is not just about houses and buildings—it’s also about gardens and landscapes. In the Genetics of Design, we write about how design affects biology and how biology affects design. Well-designed spaces make people feel comfortable and safe. They mesh with our subconscious requirements, acknowledging our biology to create the best places—and this holds true whether we’re talking about building or landscape design including gardens, parks and playgrounds. A recent issue of Parks and Recreation outlined the health benefits of greenery in Parks Are the Best Medicine which emphasized how good garden design fulfills significant biological needs—the successful garden satisfies our inclination toward socialization, our need for exercise and our desire to relax in a safe, outdoor setting. Since it is summer and the outdoors beckons, we decided to check out some local parks, visiting a few famous and not-so-famous ones to tease apart how they work. Well-designed parks offer a place to meet with friends, sit and socialize. Important, since we humans are a social species and need others for companionship and overall health. 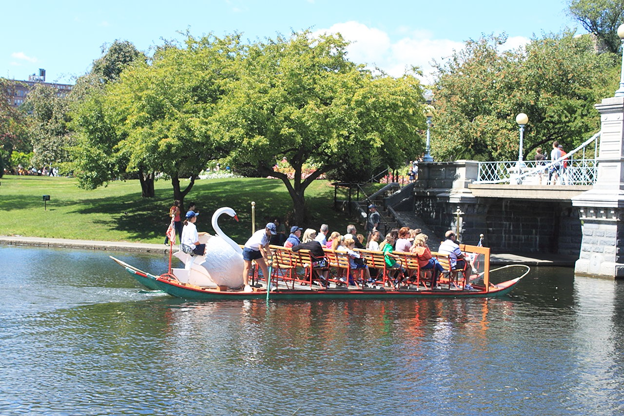 The Boston Public Garden with its Swan Boats is a prime example of successful family-oriented design. A Swan Boat ride here, a local tradition for over 135 years, is a peaceful, conversational experience. And at $3.50 per adult, and $2.00 per child (under 2 free) remains affordable too. Although every town and city cannot offer swan boat rides, communities can work to provide green gathering spots, away from traffic, with benches or picnic tables and safe walkways in a protected setting for people to enjoy and connect. 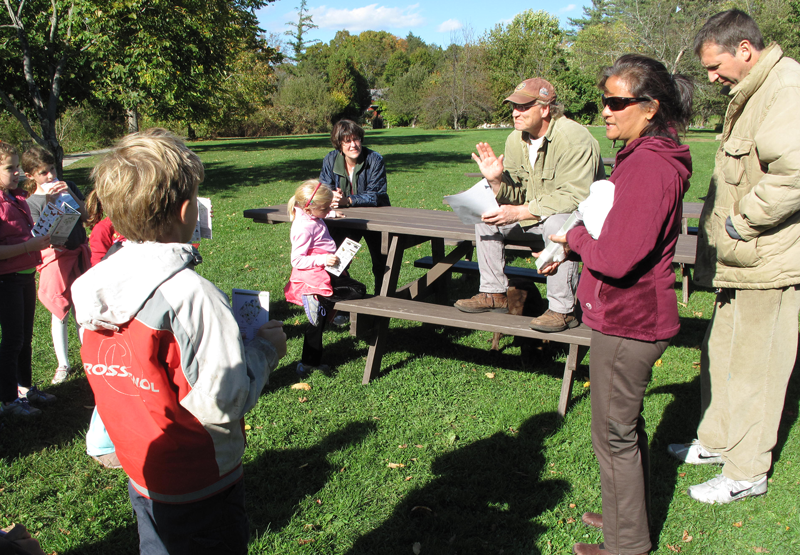 Below is a nature walk at Acton Arboretum, 25 miles west of Boston, where friends and families are talking, walking, hiking and socializing. Well-designed parks provide a place to exercise, and encourage walking, which is key to our sense of health and well-being because humans evolved to do it and need to stay at it for both mental and physical health. The best designers of urban environments often retrofit spaces for walking, running, hiking and biking. 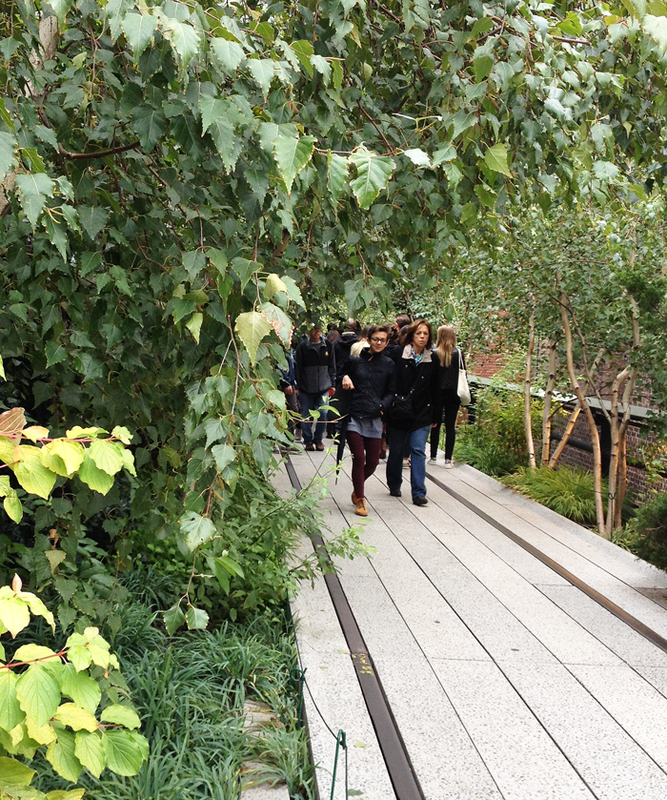 An example of a green space that offers opportunities for this sort of ambulation is New York City’s Highline Park. A former elevated railway, it goes in a more or less straight line for more than a mile; meshing perfectly with our preferred way of walking—straight ahead. One easy way for urban designers to increase exercise opportunities is to add sidewalks. 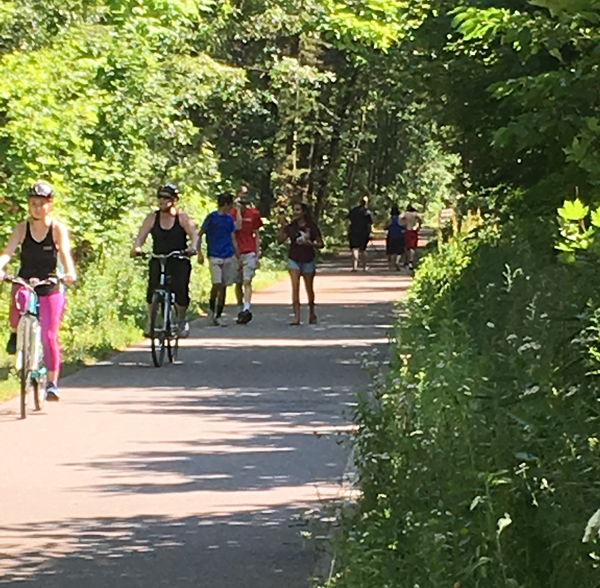 Many communities ask designers to take it one step further and convert unused railways to walking, hiking, running and biking rail trails. The Bruce Freeman Bike Trail in Chelmsford provides this sort of example. The most important aspect of a well-designed garden is rest and relaxation which delivers a big psychological benefit: de-stressing. According to University of Washington’s Green Cities: Good Health website, “… parks and green spaces are settings for cognitive respite…” A study in Scotland measured stress levels of people in green spaces and discovered that trees bring a sense of peace and calm by lowering key stress hormones. 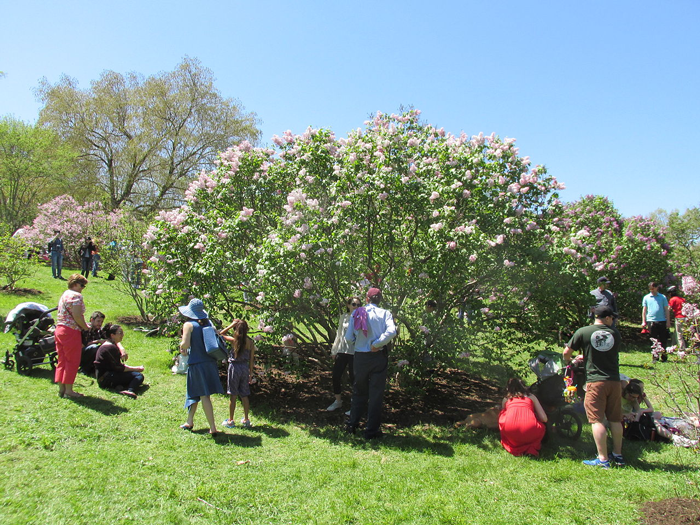 Arnold Arboretum has more than 15,000 trees to do just that. 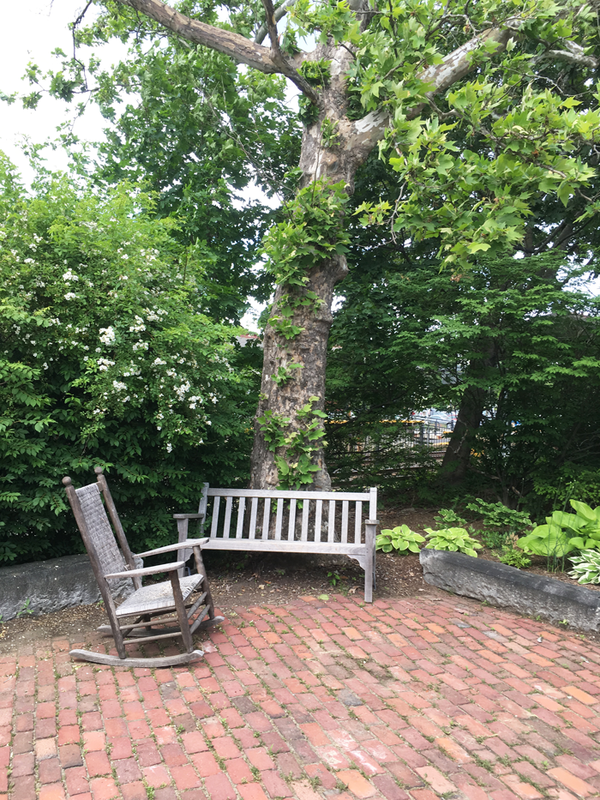 Even on a small scale, designers can add green space along a streetscape to offer respite, as shown in this mini-garden in Concord, Massachusetts. Ideally, a well-designed, urban green space will take into account our need for social interaction, exercise and relaxation in a safe, natural environment. We’ve seen well-designed gardens in this blog; in a future post, we’ll show that sometimes when designers are unaware of biology, their gardens have unhealthy—and not so satisfying—results. In the meantime, you’re welcome to share your photos of beneficial gardens with us. 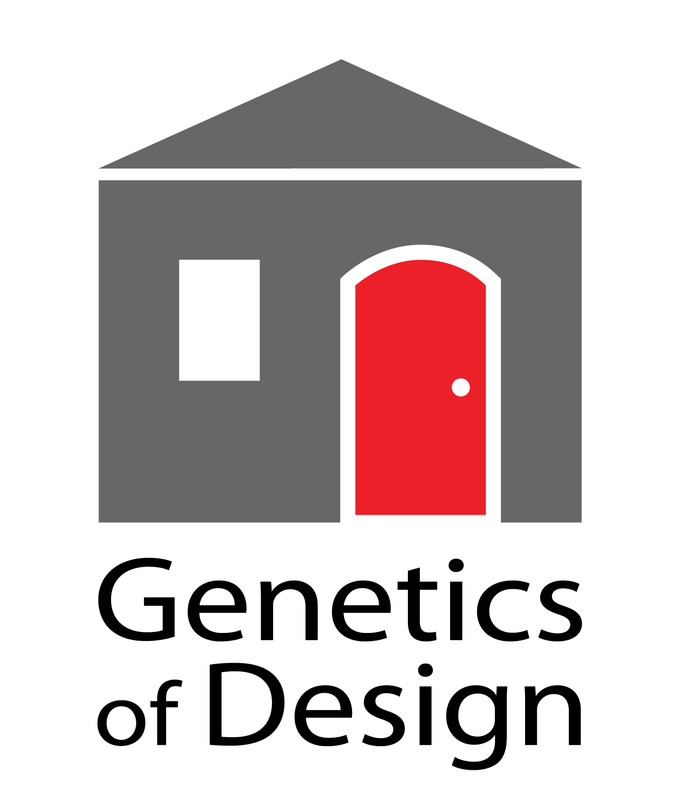 We’ll post them here at Genetics of Design. This entry was posted in Biology, Design, Exercise, Health, People-centric Design, Walkability and tagged Garden Design, gardens, Green Spaces, Health, Wellness. Bookmark the permalink.